Aaron Cook Dot Com ™ - Life, Blogging, Money. 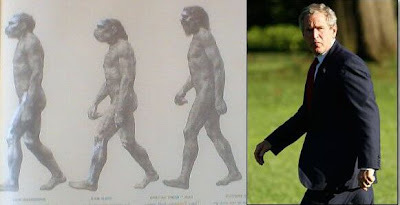 : George Bush - An Insult Even To Cavemen? Man, if those poor cavemen haven't already suffered enough, what with all those Geico commercials on TV these days, now they have to put up with this! I have one question, though...are we sure that Bush is in the right place here? I mean, it's clear that he's a bipedal primate of the family Hominidae, but I'm quite certain his scientific classification as a species is Homo neanderthalensis, not Homo sapiens. Yep, I knew they had it mixed up! Update: I just got an email from someone who thought I was making a homosexual joke about Bush since I had italicized the word Homo above. I wasn't. That is the correct way for it to be written - the correct animal nomenclature. Scientific names must be printed or written in specific ways to reduce misunderstandings among scientists who work in different countries, subdisciplines or time periods. Scientific names for the basic taxonomic levels above Genus are always capitalized, but not italicized. The Genus name is always capitalized and italicized (or underlined if hand-written), and the full species name must always be italicized. Glad you got a kick out of it too. Funny, funny, funny, funny, funny! Making fun on a such great intelligent man like him is a insult. Please, do delete this post or at least the picture. You should not make fun of our president it's unamerican and makes us look bad as United States citizens. You should take this post down now! While I very much appreciate your visit, I'm going to have to take issue with your comment here. My post is is no way Un-American. If anything here is Un-American it's your comment and your total lack of tolerance for me to be able to exercise my very American right of free speech! If you feel that you must "police" people on what they can and cannot say or write on their own blogs, then you my dear are obviously living in the wrong country. Thank you again for visiting and I sincerely hope you reconsider your stance on this issue. "Suzie of North Carolina" is right. Is totaly unamerican to make US citizens to look bad. "We, the people signed bellow, we hereby declare we think g.w.b. ceased to be a USA citizen, there for we loudly ask to withdraw above named guy`s passport, id, driving licence and his bank accounts`s money to be equally distributed to all private gas stations from US." ps : Suzie, are you sure you ever hear about Universal Declaration of Human Rights ?